I’ve been busy making Christmas presents and cleaning, so business as usual. 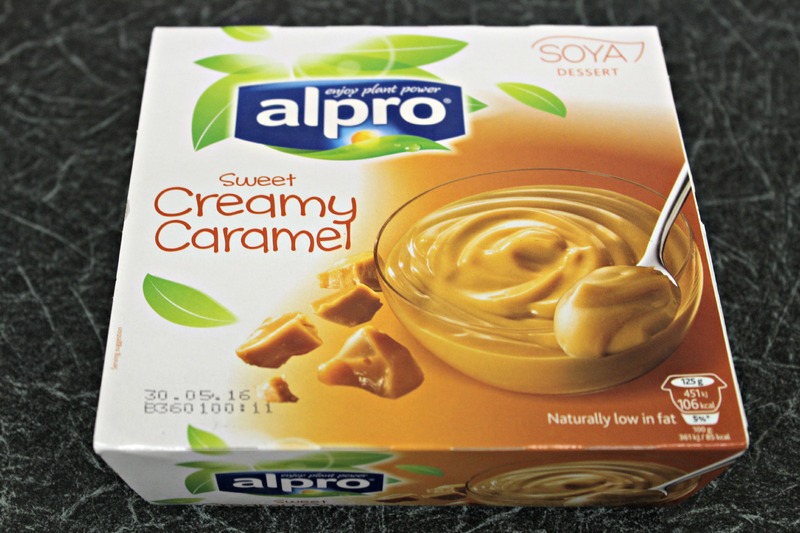 Today I’m going to review Alpro’s caramel dessert. I’ve tried every one of these little pudding tubs except the gingerbread variety, and I don’t like that flavour so this caramel one is the final destination on my Alpro dessert journey. The dessert has a sweet, creamy caramel taste with the same thick, wet texture which all of the desserts had. I’m still not sure it’s quite to my liking, but there’s something delightfully childish about slurping the pudding off the spoon. This pot still had that same background soya taste, which is to be expected from a soya dessert, but I’m not fussed on this taste. I picked up this pack of four 125g pots for £1.50 at Tesco, and I would probably buy them again, although the regular chocolate is my favourite. Ingredients: Water, sugar, hulled soya beans (6.4%), thickeners (modified tapioca starch, pectin, carrageenan), caramel sauce (sugar, water) (1%), caramelized raw cane sugar, tri-calcium phosphate, maltodextrin, flavourings, sea salt, natural flavouring, and vitamins (Riboflavin (B2), B12, D2).